731Day is bound to be full of fun all around Jackson and West Tennessee, but here are the Our Jackson Home-specific events you don't want to miss! See you on Monday, July 31. What better day to stock up on your #OJHshop gear than 731Day? 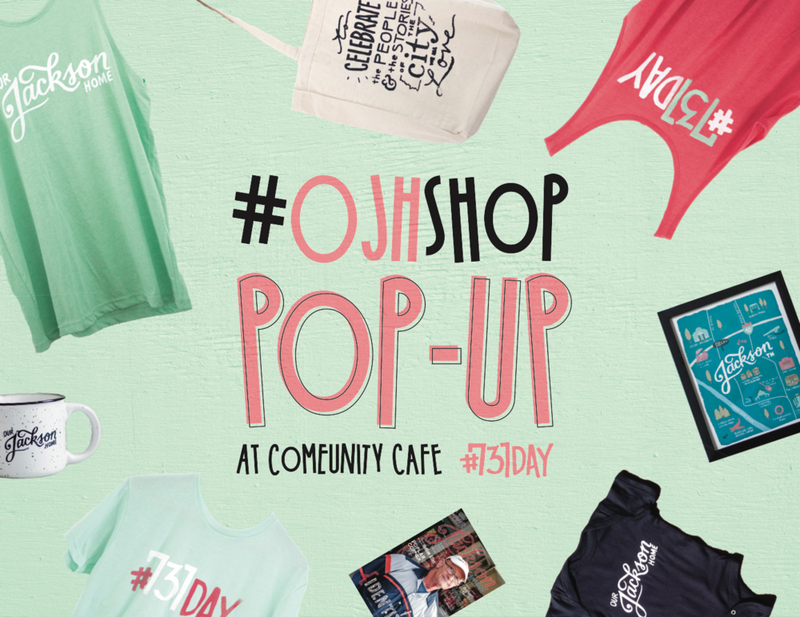 Stop by ComeUnity Cafe for lunch on Monday, July 31, to shop our apparel, journals, and other swag. (We can't wait to premiere Vol. 3, Issue 2: Day & Night, plus some extra surprises!) Can't make it over lunch? No worries—we'll be moving this shindig to our Water Balloon Fight/A Night of Storytelling at 3:30 over at the West Tennessee Farmers' Market. What better way to savor the last bit of summer than with JACKSON'S BIGGEST WATER BALLOON FIGHT?! Join us in our annual 731Day fiasco of 7,310 water balloons at the AMP—and this year, we're adding a slip-n-slide! Cool off with some sweet treats from The Snowball Shack; Holy Smokers, La Cubanita, and Stacey's Ice Cream Cruiser will also be set up starting at 5:00. theCO will also be bringing their famous CO:mobile to explore all their cool gadgets. Many thanks to our sponsor, Victory Honda Jackson, as well as the City of Jackson Fire Department for providing water! We're excited to pair up with Jackson Downtown Development Corporation to host our first annual 731Day Downtown Bar Crawl this year! Join us right after work for five unique drinking experiences all within walking distance of each other in historic downtown Jackson. Pick a bar or two to try, or come along for the full journey—no additional charges. 6pm - 7pm: Rock'n Dough Pizza & Brew Co.
Stay tuned for details on special drinks, deals, and music each bar will offer. A Night of Storytelling is a biannual Our Jackson Home event that seeks to create a warm environment for you to dig deeper into the people and places of our city by hearing personal stories from your Jackson neighbors—but lucky you, we're doing THREE events this year! Plus, we're going beyond the walls of theCO and taking you to the AMP. This event is family-friendly and free, where you'll enjoy being told six Jacksonian tales, hearing some live and local music, and listening to some Jackson poetry—after munching on some grub from local food trucks, of course. We will also have all kinds of merch available, including our brand-new August-November journal—Vol. 3, Issue 2: Day & Night. La Petite Boutique and #theCOmobile will also be set up for shopping and exploring. Food available at 5:00, storytelling begins at 7:31 (of course).